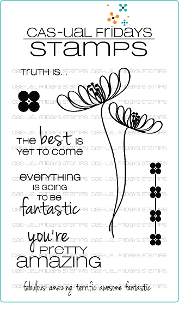 you are going to love this new die cut "Truth Bloom"! Adding some dimension goes a long way, right? As having die cuts makes it super easy to create the petals, why not!? This mini hamburger (Dr. John calls this a "slider") has absolutely no calories! It was created with 5 small Truth Bloom dies--two buns, a meat patty, lettuce, tomato and...a slice of cheese. Those "sesame seeds" are lovely, huh? A few droplets of Liquid Pearls will do the job! I think the sentiment is perfect with the image. 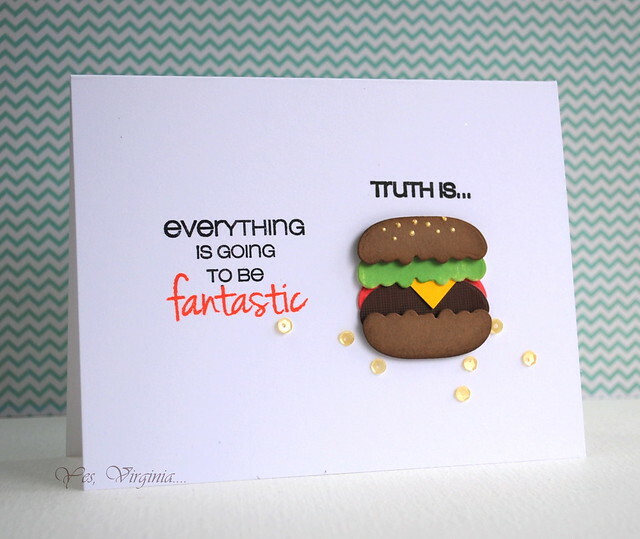 Because hamburgers make everything better...at least I think so. Please check out my CAS-ual Fridays design team mates' beautiful work here. 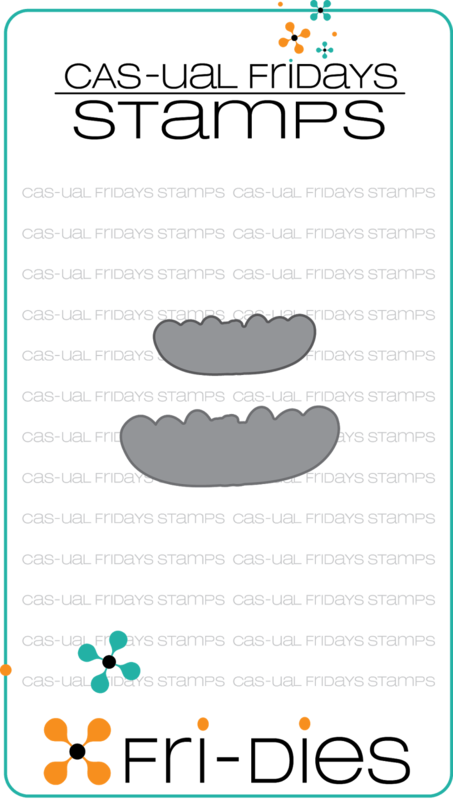 There are sales over CAS-ual Fridays; you get a 15% discount and no code is needed! We are into day 2 of the new release of CAS-ual Fridays! Today we are featuring this great Fri-die called "Bubble Box". If you see my card, you'll know what a versatile this set is. The shape is nothing like others...I love that you can stack and layer them anyway you want. They come in 5 sizes! I decided to make a shaker card! 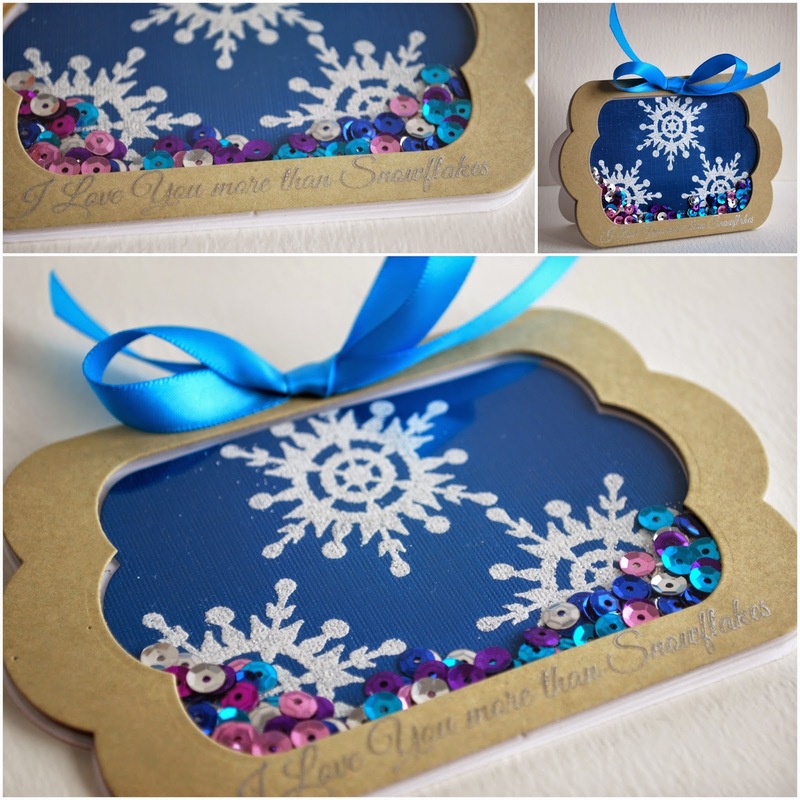 With the Must Love Snowflakes set, this card came together very easily! It is kind of hard to see, but I did stamp the sentiment in Delicata silver. I wanted a more subtle message on the shaker card. Please check out my CAS-ual Fridays Team mates' creations here. CAS-ual Fridays will be releasing another new product tomorrow and shoppers will enjoy a 15% discount. No coded needed! 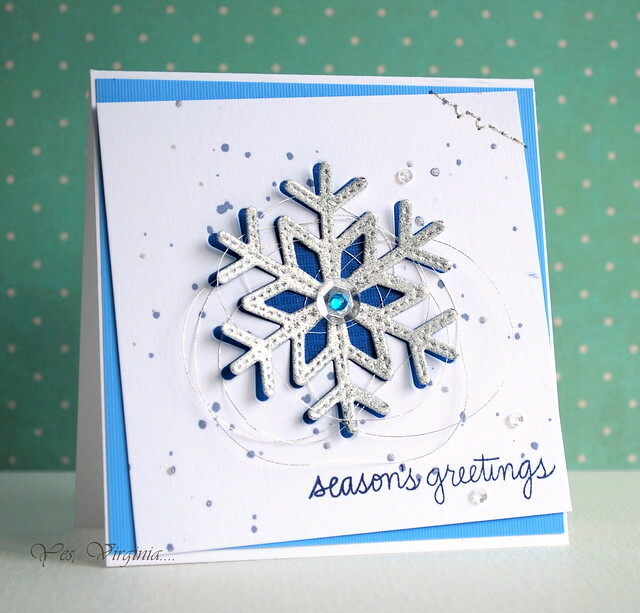 I mean the die cut snowflake...well, there is a new Fri-Die in town! Introducing Flurry. I used only one of the three snowflakes that come with this set. I think I've only scratched the surface.... I simply made 4 pieces of die cut from the card stock (white, navy blue, sky blue and silver glitter paper). I absolutely love the intricate snowflake die! I used one of the metal sheets from Add a little Dazzle. 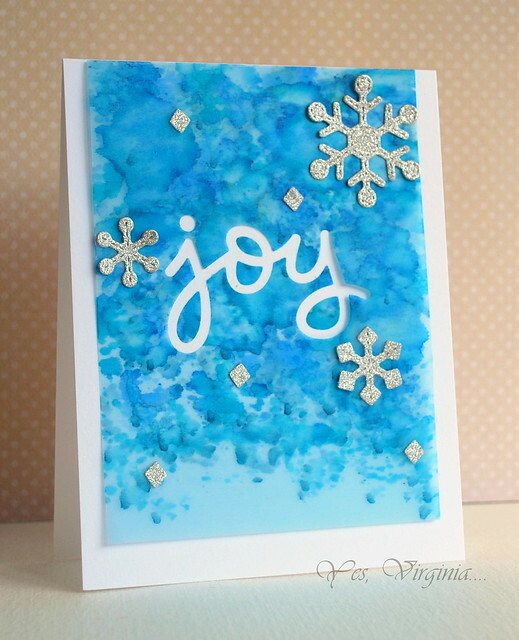 For this one I used the Precious Pearl sheet and added alcohol ink onto it. In this tag, I have three snowflake (the one in the middle, top right and bottom right). 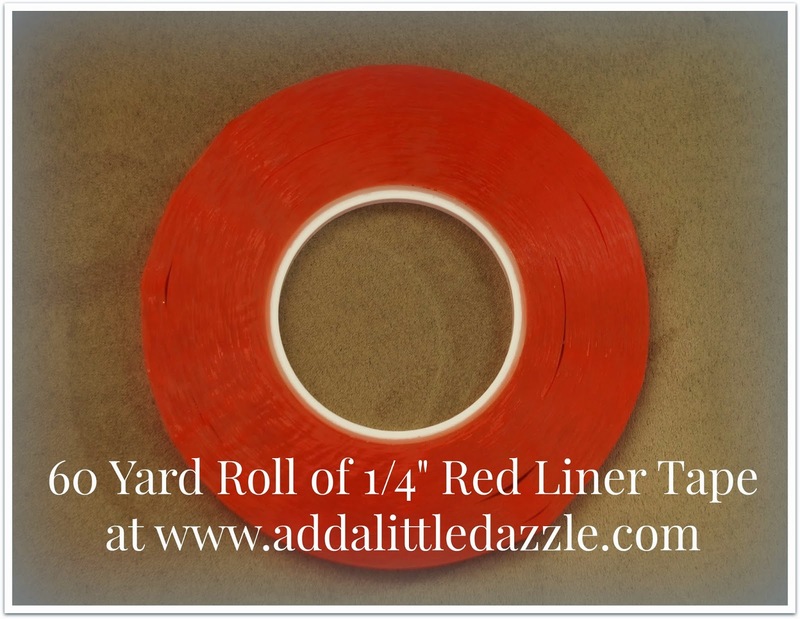 60 yard roll of Red Liner Tape for $14.99! While I'm passing on these deals to you, please check out my CAS-ual Fridays Team mates' creations here. CAS-ual Fridays will be releasing new products over the next few days and shoppers will enjoy a 15% discount. No coded needed! Yay! 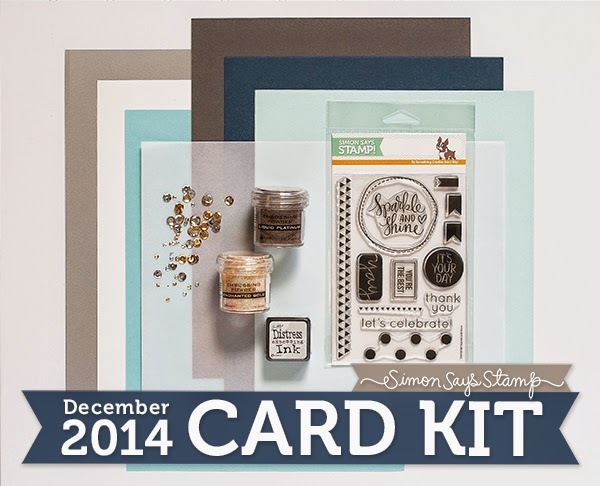 Lucky for me to get a hold of Simon Says Stamp December 2014 Card Kit.. Let me tell you how awesome this kit is. 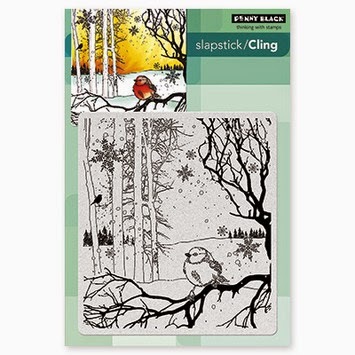 If you like embossing, this kit comes with one embossing pad (a mini one from Ranger) and two embossing powders! 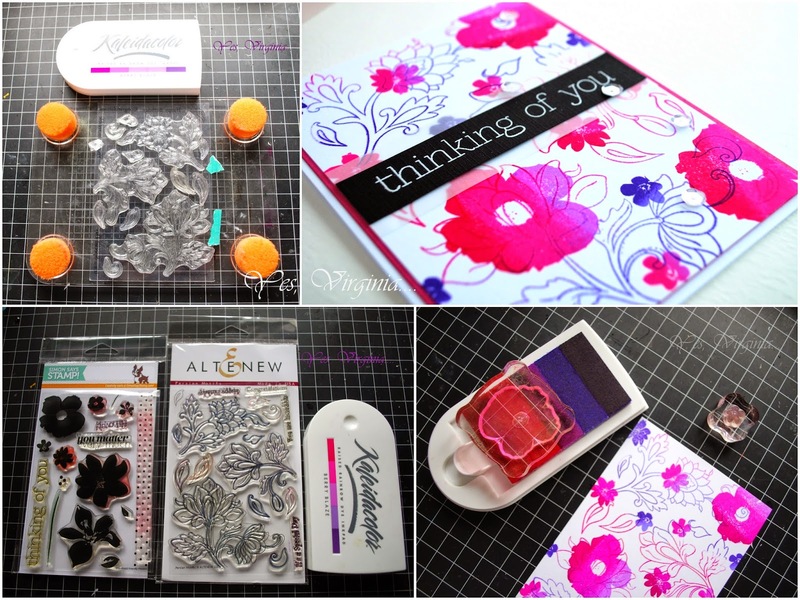 I love embossing and once I cracked the box open, I had so much fun playing with it! 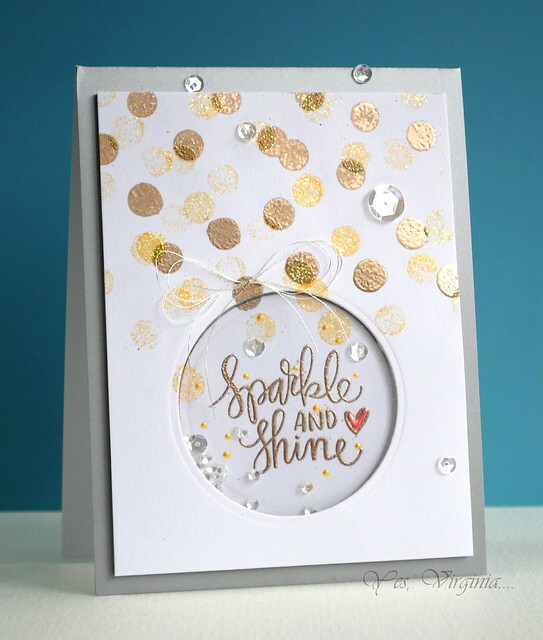 In this card, I used two types of embossing powder and created a subtle Bokeh effect. And of course, making shaker cards is always fun. For this one, I opted to use the tips from Jennifer McGuire. Here is Jennifer's video if you haven't watched it yet. I used a piece of white foam tape instead. I am now convinced that it is a better option than double sided tape! I added my own spin with this card kit and added some silver strings....other than that, this kit does have so much to offer. Tomorrow is the new release day for CAS-ual Fridays. Lots of good stuff ahead! For my project, I used Stitched Snowflakes and Scripty Joy. These two dies are AWESOME! I created the background with vellum. I inked up the blue alcohol inks and blending solution. I made a die cut with the sentiment "Joy". Then I added the Lawn Fawn snowflake (with DCWV). 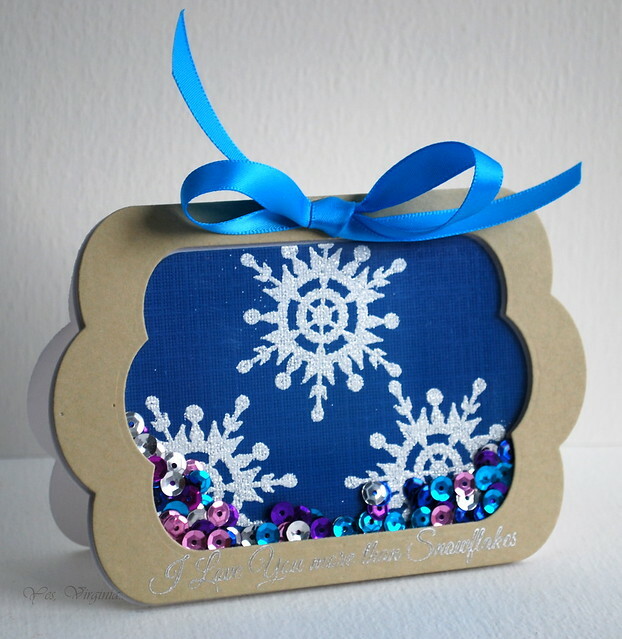 The tiny diamond pieces are part of the largest snowflake (not used in this card). So nothing goes to waste! Once I made the first card, I couldn't stop....I used the 2nd largest die from the same set (comes with 5!!!) except I used watercolors in this one. Here is a close-up. I also used the die and made my own stencil. The stenciled background made the card look more cohesive!? Annette, please contact me to claim the metal sheet prize pack! Congrats! I am excited to share my projects with you today. You see, I am the guest designer for "Add A Little Dazzle"! 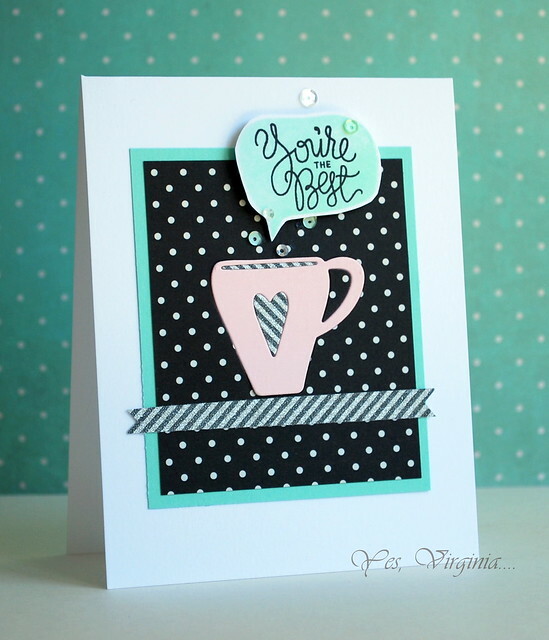 About this card: What I love about these metal sheets is that you can emboss them! 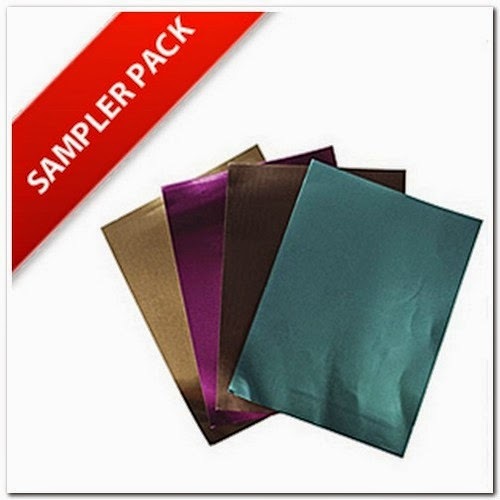 The metal paper can be delicate, but it is very pliable. 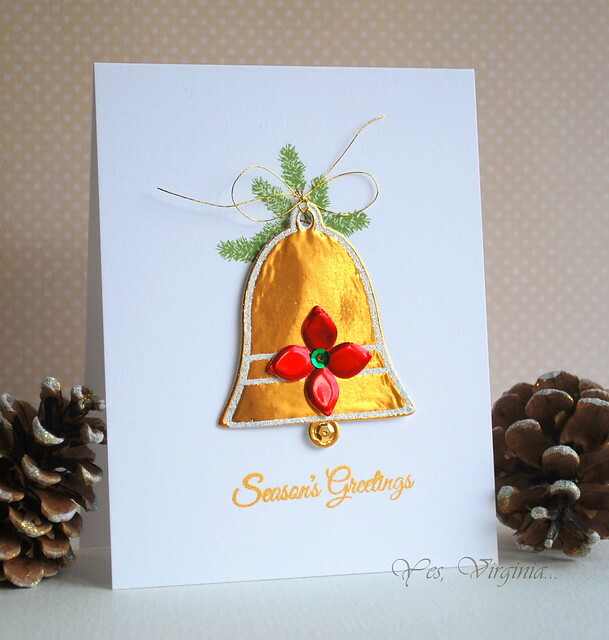 I loved this bell so much that I decided to create a holly and added to the design! Next is a very simple card. About this card: this simple card is a one layer! It sure packs a punch because of the shine from the metal sheets! A little shine goes a long way, isn't it? 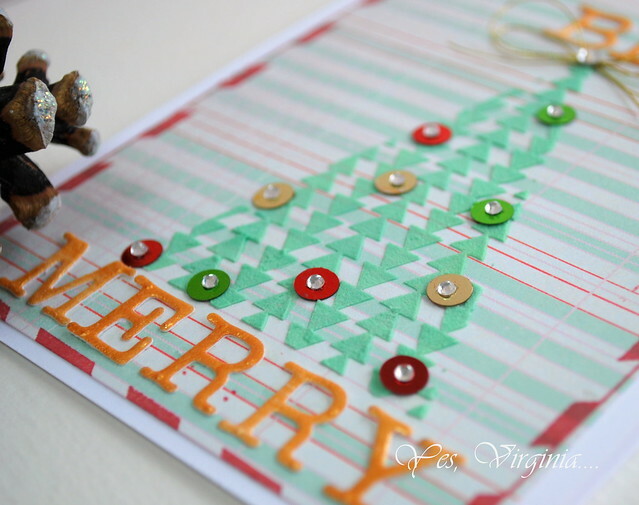 About this card: do use those pattern papers! I cut out the flower image from the pattern paper and created a background to compliment the design. I added a piece a vellum to keep the shine in balance. 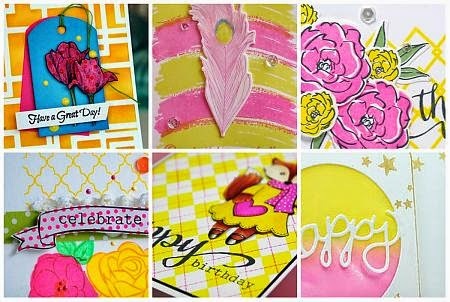 GIVEAWAY alert!----> If you would like to win a $15 Metal Sheet prize pack , please comment in this post and Add a Little Dazzle. TWO winners (one from each blog) will be picked from the comments. The giveaway will remain open until Tuesday, November 25, 2014 at midnight. Click here for your shopping! I've had the pleasure of getting to know the owner Monica and would like to thank her for this chance to guest design. Thanks for stopping by! I am sharing a card that I submitted to the World Card Making Day Contest. This was the one that did NOT make it...I won with a thank-you card instead. 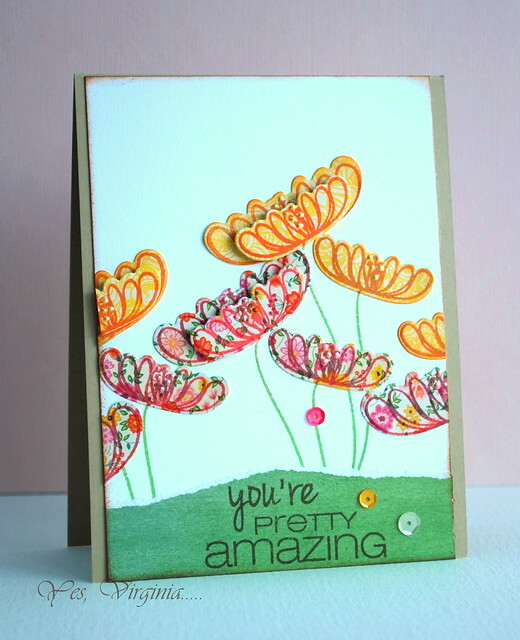 Lastly, I want to thank you, especially those who leave me kind and encouraging comments day in and day out...there will be a stamping goodies giveaway in December. Please stay tuned! I must admit that once in a while, I miss playing with my alcohol inks. 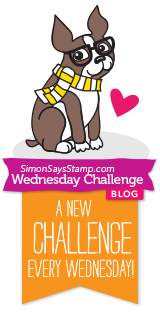 I took this lovely stamp from Penny Black and put my spin on it! Instead of a holiday/Christmas theme, I made a Hello card. 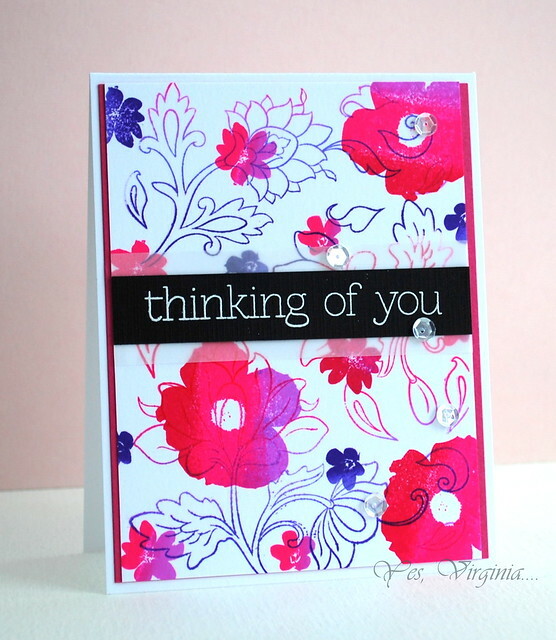 I used Epiphany from Prima Flowers (6"x 6" pad ) for the layering and sentiment. We had a lot of snowfall in the past few days (but nothing like what they got in Buffalo! I feel for them!). It's so good to play with bright-colored inks on a day like this. No, I am not trying to convince Chris and Gweneth to get back together...like ever. Nor am I attempting to get Martha and Gwyneth to become BFF. I am only sharing an example of pairing up two different stamp sets and creating a unique design. 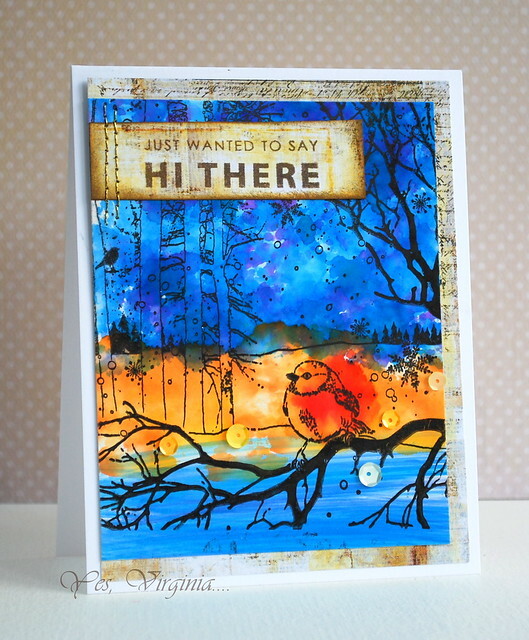 Ding---> solid stamps+outline stamps = the perfect odd couple! Creating your own background paper is easier than you think. Hope you are inspired! If you are interested in joining StampNation, you can check it out here . I will be conducting a Stamp Clinic over StampNation in early December. It's going to be fun! First of all, I did the die cut and trimmed the size down a little. Then I made the die cut with pattern paper and then pieced the two together. 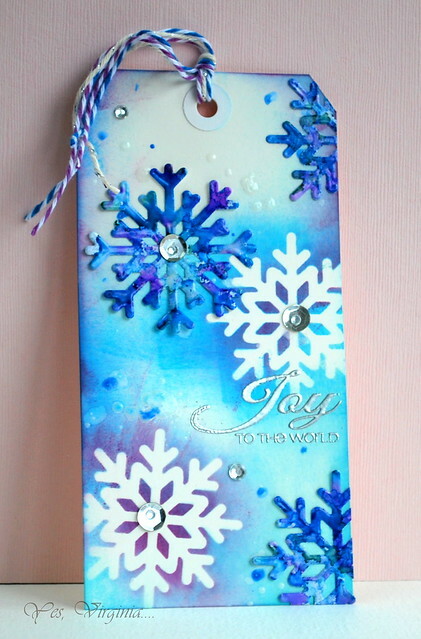 I also used the partial stencil and created the subtle background with white embossing paste. As for the sentiment at the bottom, I took out the Many Thanks and stamped the smallest sentiment. It's a freezing cold and windy kind of day here... winter sure has arrived with a vengeance since yesterday! 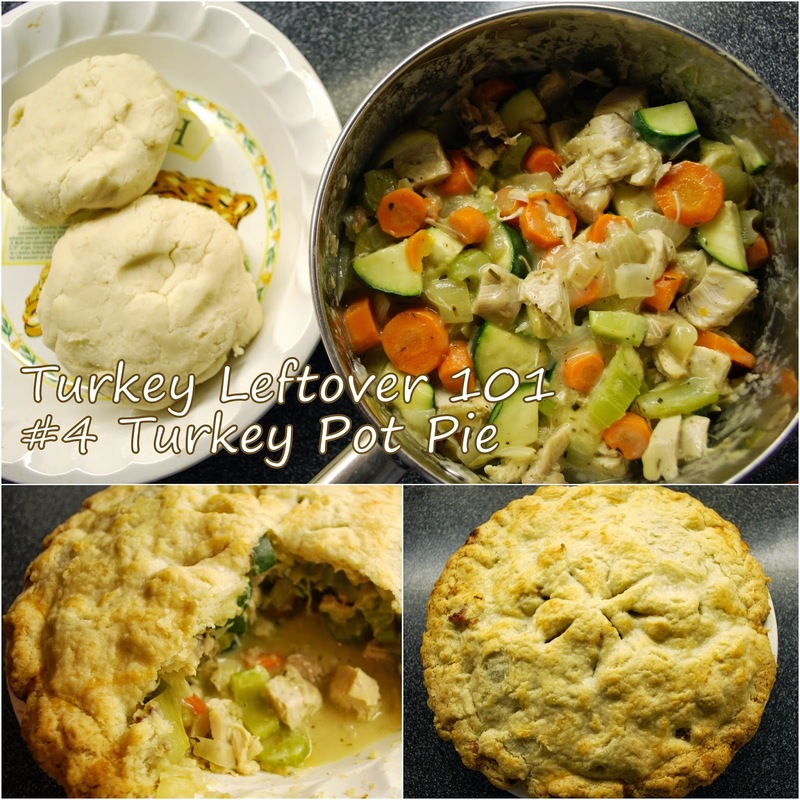 I thought it would be fun to "share" some comfort food photos. Here are some pancakes-Virginia style! These were made from Chinese dumpling filling leftover (ground pork, chives, lettuce, ginger), egg & flour. edited: at a blog friend's request, I was asked to share the "recipe"
Do make sure the mixture is not too dry and not too wet. Pan fry them with a small amount of oil. I'd say medium to high heat for 3-4 minutes on each side. Bon appetit! This is posted for your viewing pleasure only. The comment feature has been disabled in this post. Today's card was a result of my "playing". I didn't quite have a plan when I made the card. 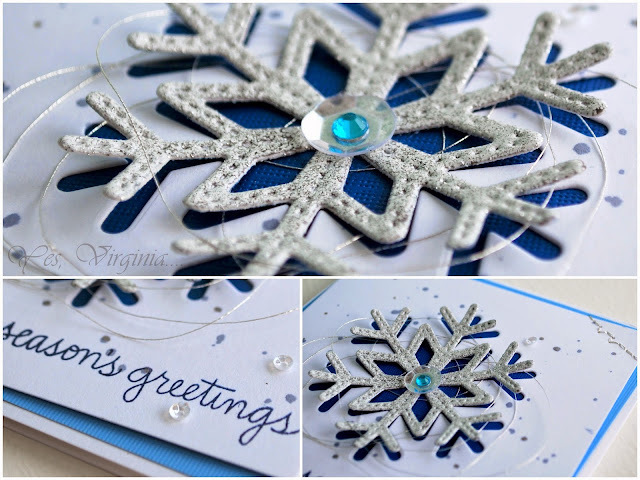 So, I started out with embossing the snowflake with two different embossing powders--Ranger's Watering Can and Michael's Sparkle. These are the two types of silver embossing powder that I own. I am in the process of acquiring a 3rd one....they can be addictive! I think it's possible a 4th one is on its way, too! 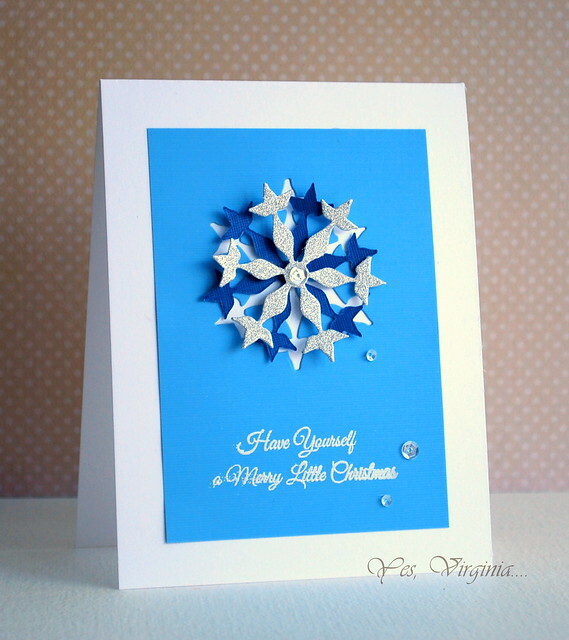 After embossing the snowflake around 4 times, I popped it up with the backing of deep blue card stock.When it came to angling the snowflake, I deliberated for a long time and finally, I took a BOLD move and made it an asymmetric design. I think the silver hot mess looks kind of nice!!? Do you have a preference as to how you position the focal image? Do you like the traditional setting (the image lies squarely in the middle) or more of a free style composition? I can't decide...at least not today. Hello, my friends! It brings me great pleasure to share my project with you today. I am part of the Come Celebrate Christmas with A Blog Named Hero. 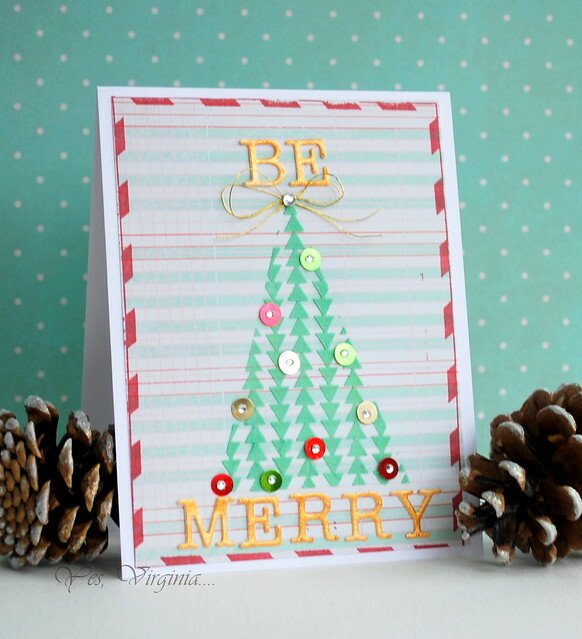 My challenge is to make a Christmas card with non-Christmas supplies and stamps. 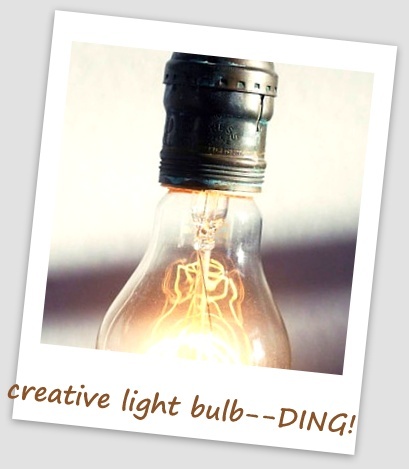 I hope that you are inspired to create holiday projects with non-holiday supplies. You will be amazed at what you can come up with. There are PRIZES to be won over ABNH. 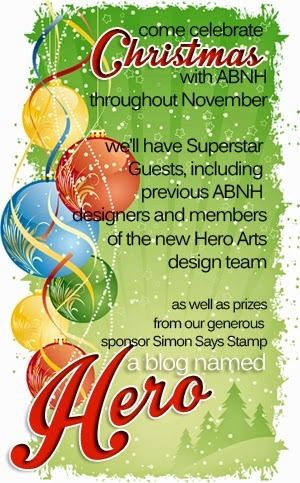 TWO gift vouchers from Simon Says Stamps and a prize package from Hero Arts are being given away to random commenters on the blogs and A Blog Named Hero. Be sure to leave a comment and enter your name ! 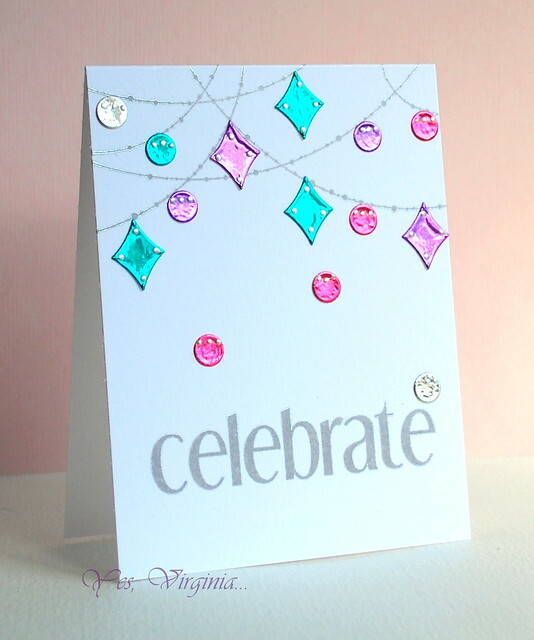 CAS-ual Fridays Stamps Blog Feature! World Card Making Day Contest NEWS!